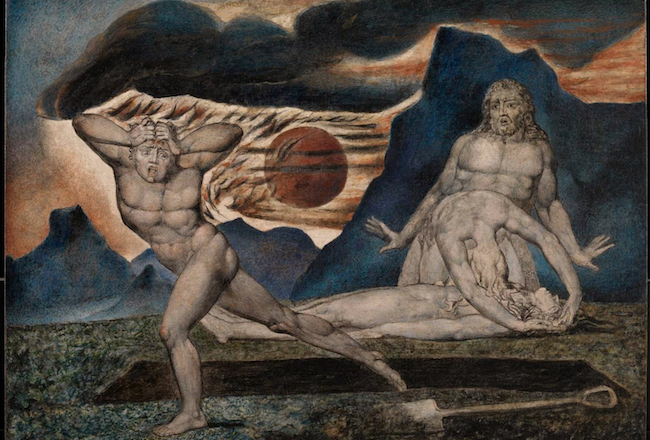 William Blake, The Body of Abel Found by Adam and Eve, 1826 © Tate / CC-BY-NC-ND 3.0 / tate.org.uk. 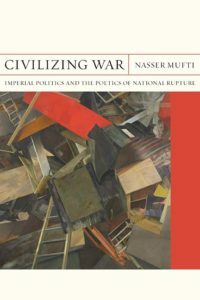 Nasser Mufti, Civilizing War: Imperial Politics and the Poetics of National Rupture. Evanston: Northwestern University Press, 2018. Nasser Mufti’s Civilizing War maps a transformation of a discourse of civility and conflict that begins in nineteenth-century England, settles in twentieth-century colonies, and returns to an uneasy twenty-first-century West. To make his claims, Mufti connects Victorian Condition of England texts to novels of postcolonial inertia to the present-day refugee crisis in order to contest a baleful “ontology of the Global South” cultivated by international “conglomerates” such as the World Bank (4). These institutions, operating with a mandate of developmental beneficence, understand civil war to be “a demodernizing force emanating out of the global periphery” (6). Civil war connotes not just conflict but the further threat of a “conflict trap” that portends endless incivility, a regressive political, social, and economic problem solvable only by intervention. Mufti’s long periodization connects this neoimperial discourse to an imperial prehistory. In the 1800s, Mufti shows, civil war marked a function (however tragic) of progress and modernization in the center. Nineteenth-century capitalism was itself understood as civil war, while twenty-first-century capitalism is hailed as civil war’s remedy. Bringing together Foucault’s “race war” and Benedict Anderson’s “imagined community,” Mufti’s study concerns not military conflict over state power, but instead the role of civic antagonism.1 Mufti takes part in a robust tradition of war scholarship that highlights the fictional divide between war and peace by signaling this binary’s co-implication in a single frame of power authorized by the state. By focusing on the civic and with an awareness of the discursive charge of war, Mufti investigates the ways in which fundamental traits of the nineteenth-century metropolitan nation—that “solid community moving steadily down (or up) history”—have come to characterize the failures and fragmentations of the twenty-first-century postcolony.2 Mufti uses “war” in Foucault’s sense to refer to “the war beneath peace,” in which war is an all-pervading force, an analytic of power rather than a particular event (31). Civilizing War narrates the changing historical and political stakes of representing this fraught social substrate and traces the ways in which literary objects mediate highly pressurized kinds of “peace” that present themselves as resolutions. Over the course of the monograph, we learn how Victorians of divergent political affiliations (Engels, Carlyle, Disraeli) struggled to map the binding consequences of class antagonism within domestic space; how not-quite anti-imperial British modernists (Kipling, Conrad) grappled with the instability of the social, cultural, political, and economic boundaries of imperial power; and how postcolonial novelists (Naipaul, Coetzee, Gordimer) battled in place, narrating boundless interregnums resolvable neither by foreign intervention nor anticolonial nationalism. In Part 1, “Civility,” Mufti shows that the “poetics of national rupture” is as engaged in the structural conditions of nationhood as is a unifying imagined community. Mufti considers Engels’s The Conditions of the Working Class in England in light of the narrative challenges newly posed by Marxism. Engels’s poetics constitute a broken topography of “fragmentary narratives incapable of progressing through linear sequence” (38). Contextualizing this poetic and political transformation in the “generic development of realist omniscience,” Mufti shows how Engels’s bewildered portrayals of England’s “great towns” contrast with a “Boz-like omniscience” in which the relationship between episode and totality of episodes is that of part to whole, and the “panoptic authority” of Dickens’s Bleak House, in which the Benthamite prison is “formalized” into plot, pressing “toward closure” (41). Next, Mufti elaborates the significance of Carlyle’s intertwining of the figure of the “cash-nexus” of wage labor with the metaphor of fratricide.7 “Carlyle,” notes Mufti, “describes the class war between factory owner and his worker as akin to Cain’s murder of his kin Abel” (24). Carlyle’s figure of the “nexus,” “literally meaning ‘connection’ or ‘binding together,’ gives form to English society by un-forming it” (45). Bourgeois and proletarian are “joined by a ‘bond of division’” to an extreme degree as Carlyle allows the flattening abstraction of capital to overtake the metaphor and complicate the role of racial politics more than the other Victorians discussed in the book. Contrast with Arnold’s “aesthetic conception of history” suggests intriguingly that it is Carlyle’s de-aestheticization of history that constitutes his poetics (62). And in his consideration of Disraeli’s Sybil, or The Two Nations, Mufti convincingly diverges from standard readings of the novel, demonstrating that while Disraeli’s unitary “fictive ethnicity” for England does follow the “very same protocols of nationalist historiography” it also “supplants a narrative of fraternity with that of an extended fratricide” (14). Part 2, “Civilizing Mission,” explores the destabilizing effect of an increasingly global metropolitan imaginary in the late-nineteenth century. This “most ambitious moment in the British empire” was also when “it became possible for Britons to see civil war as possible at the peripheries of empire” (88). The Kipling chapter is among the book’s strongest, underscoring the value of comparative methods to studies of imperialism in its attention to multilingual poetics and the politics of translation. Mufti discovers rare subtleties in Kipling’s jingoism, complicating Said’s contrapuntal reading with an exploration of Kipling’s “phonic imperium,” in which homophonic wordplay muddles thresholds between metropole and colony (97). Mufti’s reading of Conrad’s Nostromo represents an important contribution to studies of modernist historical novels by articulating the historical value of modernist form’s resistance to resolution. Rather than merely fragmenting the political stakes of the nineteenth-century historical novel, Nostromo prefigures postcolonial resistance to external development by formalizing desire for closure as agonizingly inseparable from a sense of imperial triumph. This concentration on the genre of historical novel carries through into Part 3, “Incivility,” in which Mufti demonstrates how “the postcolonial historical novel has both anticipated and displaced the contemporary truism that civil war hinders progress” (18). Arguing against canonical postcolonial critiques (Achebe, Said) of Naipaul, Mufti clarifies the significance of Naipaul’s debt to Conrad. Nostromo’s dead-ends of imperialism inform A Bend in the River’s stagnant postcolony, a tragic poetics that limits futurity to Europe but also disavows the power of international development. In the final chapter, Mufti demonstrates how Gordimer’s July’s People provides a romantic alternative to Naipaul’s postcolonial tragedy in its unresolved historical fiction of civil war set a decade before the end of apartheid. Mufti marginalizes readings of the novel’s open-ended final scene that see it as historical “dead end” or “revolutionary standpoint” and instead argues for the importance of a poetics of interregnum that is both open to a future and grounded in the difficulty of seeing that future through. Mufti’s interregnum is not a transition between, but rather an impasse before (177). Civilizing War is quietly invested in the incompatibility between its lens of war and a poetics of revolution or utopia. It instead explores the aesthetic’s capacity to highlight fractured axes of national belonging and the contingency of sovereign form. The haunting Saidian closure of the book’s Coda—“The East is still a career” castigates a geopolitics in which refugees are flatly valued or fatally rejected based on their capacities for hard work and expertise. This “still” tasks its readers with the responsibility of remembering that strong borders exist in dynamic relation to suppressed historical fault lines (184). In this way, Mufti’s monograph is perhaps most at home in a wide division of transdiscplinary scholarship interested in the constitutive negations produced by imperial and state power, from Eve Sedgwick’s writing on the hegemony of ignorance in Epistemology of the Closet, to Aamir Mufti’s recent work on world literature as dependent on English as a “vanishing mediator,”8 to anti-imperial sociology and history interested in the study of how things come to be unknown.9 Civilizing War, in its sustained emphasis on antipathies, silences, blind spots, forgetting, confusion, and irresolution seeks in this tradition to detail the stakes of including these negativities in our historical consideration of poetics and politics and the difference they make in our understanding of the present. Michel Foucault, Society Must Be Defended (New York, Picador, 2003); Benedict Anderson, Imagined Communities: Reflections on the Origin and Spread of Nationalism (London: Verso, 2006). Ted Underwood, Why Literary Periods Mattered: Historical Contrast and the Prestige of English Studies (Stanford: Stanford University Press, 2013), 22. Michel Foucault, Society Must Be Defended (New York, Picador, 2003), 88. Michel Foucault, The Birth of Biopolitics (New York, Picador, 2004), 77. Mufti seems to be both departing from and elaborating on Foucault in significant ways: with the economic bent of modernity and nationhood imported from Anderson, with the insistence on social class (jarring when considering that Foucault’s “race war” is as interested in decentering the state as it is in provincializing Marxist emphases on class struggle), and with his overarching critique of the way a non-state power like the World Bank exercises a kind of sovereign power to create fictional ontologies. Mufti’s focus on fratricide is culled in part from Anderson, for whom “the reassurance of fratricide” signifies a codependence of antagonism and relation where national unities of the present are enabled by past-tense conflict. In both, an unacknowledged masculinism attaches to this device, in which the “fellow” of the fellow feeling and fellow fighting of civil war that fraternity/fratricide describe often falls too literally into a false universal. If “fratricide” names a specific violence between intimates and that violence marks a moment of (historical, economic, political) mediation for the literary text, creating and accounting for form, then what wider sense than Cain-and-Abel thinking could this violence take? Or at least, what do the exclusions of this gendering/kinship model signify? Aamir Mufti, Forget English! Orientalisms and World Literatures (Cambridge, Harvard University Press, 2016), 16. See for example Londa Schiebinger’s application of Robert N. Proctor’s “agnotology,” notably in her recent book Secret Cures of Slaves: People Plants and Medicine in the Eighteenth-Century Atlantic World (Stanford, Stanford University Press, 2017). 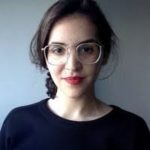 Devorah Fischler is a PhD Candidate in Comparative Literature and Literary Theory at the University of Pennsylvania.